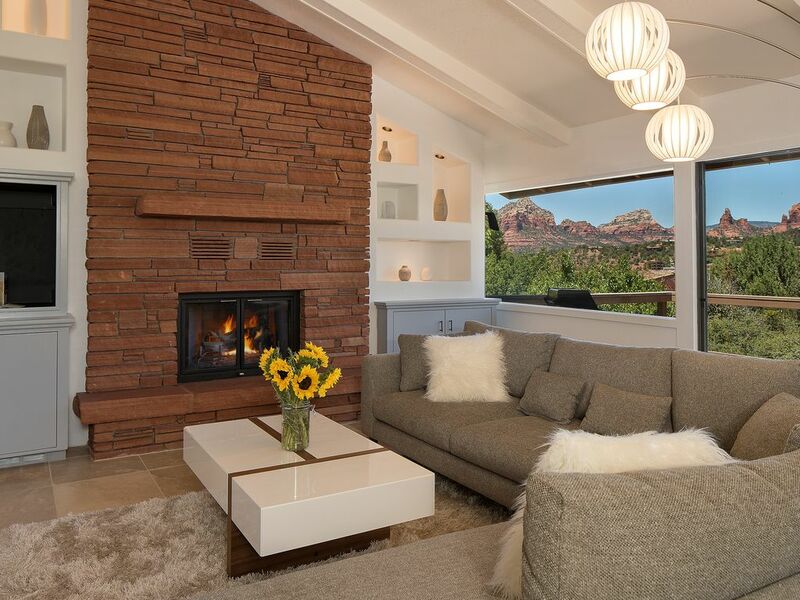 Just below Snoopy Rock is our 1900 square foot newly-renovated contemporary adult home in an upscale private neighborhood in uptown Sedona! Literally minutes and walking distance from restaurants, galleries, shopping and the famous Tlaquepaque! Spectacular red rock views, tranquility and privacy surround this 2 bedroom, 2 bath home. 55 inch HD TV, cable, high-speed internet, home theatre system with Wi-Fi, Bluetooth and USB connectivity, along with a fireplace are just a few amenities in the great room! Baby grand piano for the musically inspired and a fully stocked kitchen for the chef inspired. All new appliances, dishware, including a Nutri-Bullet Pro to whip up your favorite veggie-fruit juices to keep you healthy while you bike or hike the beautiful trails! 2 patio decks: One off the great room is equipped with an outdoor BBQ and seating to enjoy cocktails and dining while you gaze at the red rocks in front of you. The other off the Master Bedroom. Full laundry facility available too! Spectacular views of red rocks off the main Living area, Bedroom, and Patio! Beautiful home, impeccably maintained, gorgeous views, convenient location, quiet neighborhood. Our stay was perfect. Greg and Nancy were attentive and responsive hosts, the house is beautiful, and located in a quiet neighborhood close to shops but away from hustle and bustle. Views are stunning. The property is well appointed, and has a fabulous view! We would definitely stay again when visiting Sedona. Wonderful Stay at Sedona View!!! Your home and your level of care for us exceeded our expectations! Thank you so much for providing a great place for us to stay. If this home is available for your dates, just go ahead and book it. You will not be disappointed. The location is great and all the other reviews have summed up how perfect this rental is. Highly recommend! My husband and I went to Sedona for a week. We hiked everyday. The house was perfeclty located, so beautiful, very clean and very quiet at night. We had breakfast there everyday and a couple of lunches and dinners. The house has everything you need. The house is like the pictures and more. AND the view ... WOW ! The owners are very friendly to communicate with and the arrival was easy. Parking is spacious. We had a great stay at this property! The place was immaculate, the sheets and beds were very comfortable, the kitchen had everything you could need including good coffee, and you can't beat the location relative to town, as well as the view. Thank you!